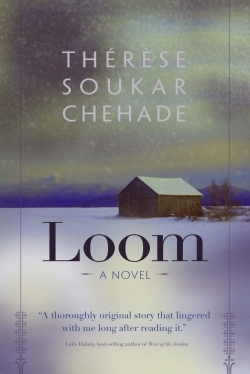 Thérèse Soukar Chehade’s novel, Loom, is an entire story formed within a pause. Snow falls in a small Vermont town, and the members of the Zaydan family come to a halt while their cousin from Lebanon is delayed in New York. What ensues over the next twenty-four hours is spellbinding, and reveals a history of secrets and resentments, of undisclosed pain and unshakeable love. Told from the points of view of the four Zaydan women and the neighbor they call “Loom,” this story delves inside a family which keeps much from one another, and much even from themselves. Chehade’s first novel is characterized by refined, attentive prose—gorgeous but unpretentious, and skillfully adapted to whoever has the floor. Marie, the teenager, loathes the silence of the house, and says, “In the kitchen, my mother slams doors, bangs pans on the stove, and leaves the water running. I could swear she has replaced language with a steady rumble.” How much can be said without speaking a word is this family’s modus operandi , the results of which are several lifetimes of misunderstandings. Rivalries, jealousies, and dangerous attractions are all brought to bear as the hours unfold, though each woman persists in keeping any revelations to herself. The snow, which worsens by the minute, provides the perfect backdrop with its mute persistence and unrelenting force. For Josephine, the middle-aged, unmarried daughter, “the snow creates…a temporary sanctuary from daily life, a quiet devastation where freedom might unexpectedly dawn.” Each character secretly waits for this freedom in order to become content or to make sense of her past. It isn’t until the matriarch of the family, Emilie, heads out into the storm to bring food to Loom that they are all stirred from their isolation and move into the world. How does one achieve peace after years of unrest? Emilie says, “Some things you never leave behind. They become one with you and you aren’t aware that you are carrying them within until someone tells you to look inside.” This novel is that look, and what flows forth is both specific and universal, particular to these lives, and yet wholly felt in the bones of the reader. If the novel does not provide the answer to suffering, it is a genuine portrait of how cleansing might take place. The snow becomes, as Loom notes, “The thing by which you can perish saving you.” The storm gives these characters permission to brood, to reflect, and ultimately, to forgive.